The last two weeks were not necessarily going to be especially good for the Cleveland Indians. Jason Kipnis was suddenly back on the disabled list, as were Andrew Miller and Danny Salazar. Michael Brantley and Lonnie Chisenhall and Josh Tomlin had been there for weeks. The team’s lead over Minnesota was decently comfortable—four and a half games—but hardly ironclad, especially with a roster increasingly full with rookie call-ups and injury replacements. But the last two weeks, obviously, have been especially good for Cleveland. Extremely good! Tonight’s 5-1 victory over the White Sox was their 14th in a row, tying the franchise record for longest win streak that they set last season. Their best-in-baseball pitching staff has continued apace, disastrous return of Danny Salazar aside, with predictable gems from Corey Kluber and Carlos Carrasco. What’s really been made the difference, then, has been their bats—they entered tonight hitting a collective .324/.401/.582 in the two weeks since the win streak started. No one has been more dazzling in that time than José Ramírez, who is really only continuing a season-long display of dazzle here. He entered tonight hitting .431./453/1.039 during the streak, with seven home runs. 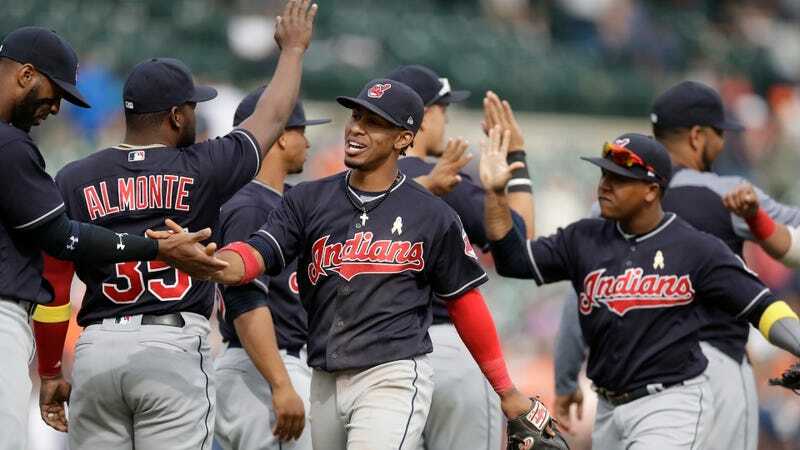 The best record in the American League is now within reach for Cleveland, who sit two and a half games behind the once-seemingly-uncatchable Houston Astros. And with Kluber on the mound tomorrow night against the White Sox, they have a pretty good chance of extending this winning streak into a record on its own.